Beautifully updated 2 bedroom, 1 bathroom MAIN LEVEL suite in Niakwa Estates. 1000 sqft of living space on one level. High-quality laminate flooring throughout with new deluxe click-lock vinyl laminate flooring in kitchen, wood fireplace, formal dining area, large master bedroom and full-sized 2nd bedroom. Pantry and ample cupboard space in kitchen. All newer appliances (including small chest freezer), new hot water tank, in-suite laundry, and both indoor and outdoor storage areas. Water, garbage disposal and recycling included. One UNDERGROUND parking spot within steps of the suite, and a private outdoor fenced yard. 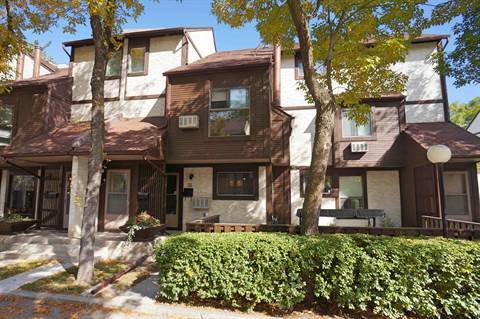 This townhouse-style condominium is ideally located within walking distance of schools, Safeway, Superstore, St Vital Curling Club, Seine River pathways, the renowned Niakwa Golf & Country Club and Windsor Park Golf Course. Park and playground within a block. Plenty of nearby greenspace for walking, cycling, and running. Vivint Alarm system included in rental price.